During the excavation no traces of any of the clothes belonging to the crew or the officials was found except some minute fibers that could equally well or as a matter of fact, more likely, originated from the sails or general rigging. It is however interesting to try to figure out how people on board an early to mid 18th century East Indiaman was dressed. To figure this out I have drawn from various online resources regarding how European men of various occupations was dressed. To out help we also have pottery models, painted enamel decorations from export porcelain and a variety of portraits of the more successful officials. However, we can not know if they choose to dress the same on land as on board. Very likely there would have been some differences. The Supracargoes were the owners representatives on board and often participated with a large financial stake in the voyages, being major shareholders or lenders to the individual cargoes as well as being permitted to take on board a considerable amount of merchandises on their own accounts. They had the highest rank on board and was giving the Captain orders on destinations. 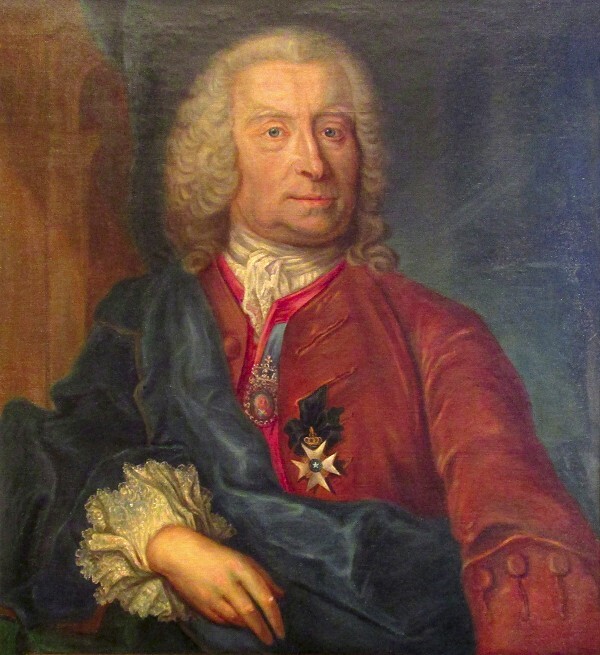 During the first half of the 18th century the Supracargoes were of Scottish descent and most likely dressed as most European noblemen and successful merchants. 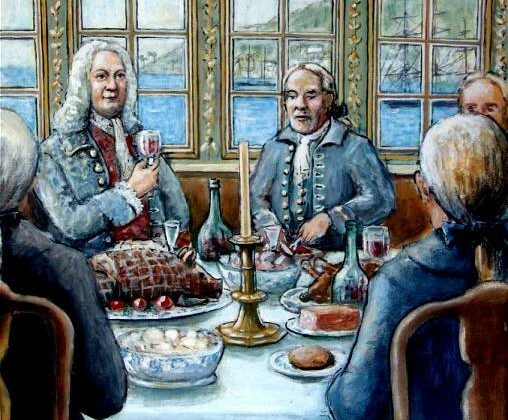 The seating at the first table was settled in the ships regulations ahead of departure. The captain and other officers on board was in general taken from the navy, and it would be likely that they on board was wearing more or less the outfit they would normally wear in active duty in the navy. The crew was mostly farm hands that only gradually became seasoned East India travelers. We must assume that their clothes must have been what they wore when they signed up as a crew plus what other sailors would have helped them to acquire, plus eventually any fancy stuff they would pick up during the voyages, hat would set them apart from the common sailors once they sat foot on land after homecoming. Clothes also varied with the seasons. From various diaries such as Wallenberg, Min son på Galejan, we have been given some descriptions of the crews clothes when still at anchor in the freezing winter weather at Rivö Fjord before departure. Clothes also varied with the seasons, from ice cold winter at departure to the tropical weather of South East Asia and southern China. Many men of the 18th century chose great coats as their protective outer garment in foul weather. Most often made of heavy fulled woolens, it served well to keep one warm and dry. Some men are known to have had accompanying waistcoats and leggings made in the same heavy wools. The great coat generally had a collar, a cape over the shoulders, deep cuffs, and was worn to knee length or longer. Occasionally, great coats were made in alternative fabrics of lighter weights, particularly oiled silk and linen. Towards the end of the 17th century the vast wigs then worn by some men made it impractical for them to wear the fashionable broad-brimmed hat unless necessary. Custom dictated, however, that hats should then be carried beneath the arm. Rapidly, the hat began to be folded to make it easier to carry. 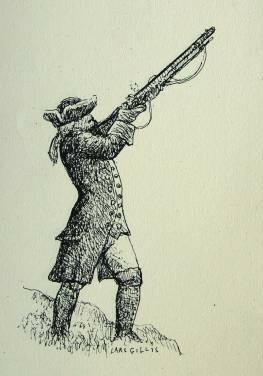 In the 18th century this habit and changing fashions led to many sorts of folded or cocked hats - cocked on one, two, or three sides. It was the hat with three sides cocked that dominated fashion and was seen in innumerable variations of adornment and proportion. While beaver felt was the preferred material others, including wool and camel's down, were available. Since a man's breeches of the 18th century came to just beneath the knee, a covering for the lower leg was useful for warmth and protection. Leggings fully covered the lower leg from a few inches above the knee extending to cover the top of the foot. Spatterdashes covered the leg from the mid-shin to the top of the foot. Made of stout woolen or linen cloth or of leather, leggings and spatterdashes were worn by the sporting gentleman, laboring man, and the military. 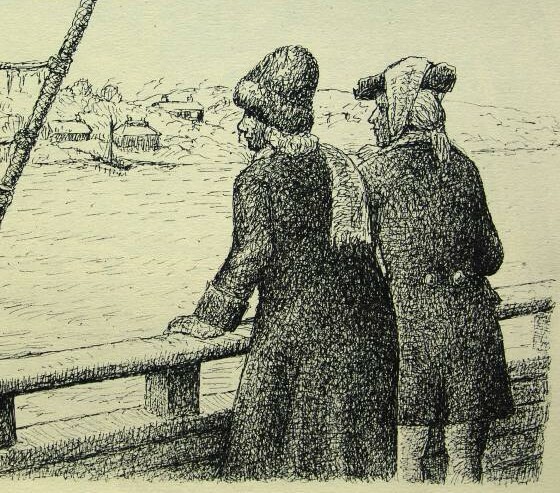 In the 17th and 18th centuries small knitted woolen caps worn by the laboring sort, sailors, and western slaves were often referred to as "Monmouth Caps." The name is derived from one of England's great port cities and its particular associations with seafaring. Knitting of caps and stockings was a common pastime for sailors, they sold their wares in the dock streets for additional income. The shirt was worn as a man's undergarment, covering the body from neck to knee. Most were made of white linen which could be very fine or very coarse. A gentleman's best shirt may have ruffles (ruffs) at the wrist and/or breast. A laborer's shirt was sometimes made of unbleached linen or small patterned checks and stripes. A plain shirt might serve as a nightshirt. Men's shoes were made in a great variety of styles and qualities. Fashionable low-heeled shoes or pumps were of softer leather, coarse common shoes of sturdier leathers. Black was by far the most usual color, and only occasionally were other colors seen. While buckles were the primary mode of fastening, ties were worn for utilitarian purposes. Boots of many sorts were worn for sporting, riding and working. Stockings of the 18th century were worn by men and women, and were most often knit. The knitting frame (machine) was developed in the late 16th century and many improvements during the 18th century increasingly forced hand knitters from their business. Fashionable stockings of silk or cotton were generally white, and at times were decorated with knit or embroidered patterns at the ankle, referred to as "clocks" or "clocking." More utilitarian stockings of linen, and particularly worsted wool, were seen in colors, with blue and gray predominating. Occasionally, coarse stockings for the low laboring sort and slaves were cut of woolen or linen cloth and sewn to fit the shape of the leg. The 18th century man was almost never seen without his waistcoat. Not to have it on was considered "undressed." The waistcoat, or vest, of the 1770s was fashionably worn to the upper part of the thigh, opening in a "V" beneath the stomach. Waistcoats were made in all qualities of silk, cotton, wool, and linens. If adorned, it could be embroidered, printed, brocaded, quilted, tasselled, silver or gold laced, and was generally the most elaborate article of men's dress. When worn for utilitarian purposes it could have sleeves, be called a jacket, and worn outermost instead of a longer skirted fashionable coat. Throughout western history wigs have come and gone from fashion, but it is undeniably the 18th century that was the golden age of male wig wearing. In the second half of the prior century wigs had entered into court fashion in both England and France. In the early years of the 18th century the Full Bottomed Periwig reigned with its cascade of curls. As the century progressed, the proportion of the wig generally decreased and the variety of fashionable forms expanded greatly. By mid century wig wearing was available to most levels of society for the individuals who chose to do so. While certain styles of wigs became associated with particular professionals; the vast majority of wigs had no particular connotations. Made of human, horse, goat, or yak hair, the choice of material and styles changed constantly with fashion and personal preferences. In the closing decade of the century the wearing of wigs was less common amongst the young and fashionable sort, although some conservatives continued to wear wigs into the 19th century.